VISTA — An ultimate grilled cheese sandwich, homemade roasted tomato soup and a mixed berry crumble topped with vanilla gelato are on the November menu at the student-run Panther Cafe. For the past seven years, Vista High School culinary arts and agriculture classes have teamed up to grow, cook and serve fresh meals for the community. Culinary students use what is grown by agriculture students, along with other ingredients, to create bimonthly lunches served at the school’s cafe. Lunches include soup or salad, an entree, a dessert and a beverage. Yara Castillo Reyes displays her handiwork. 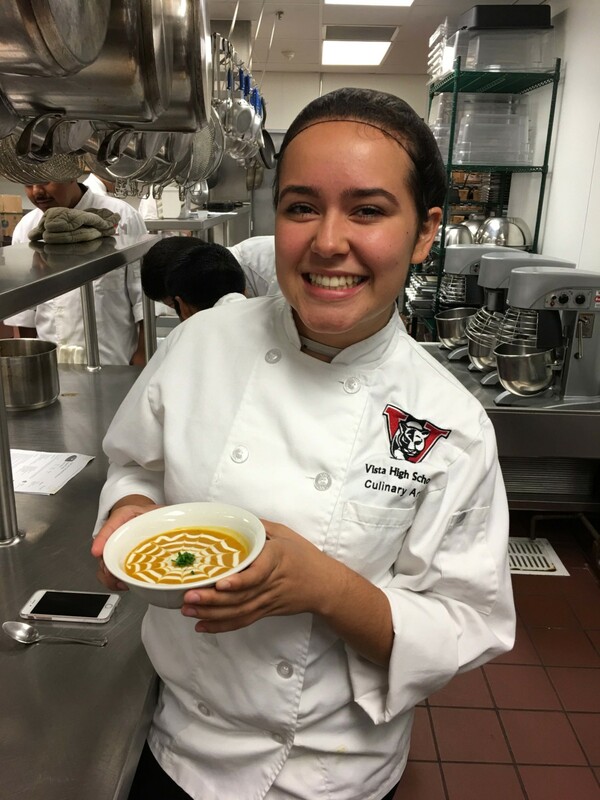 She is among the Vista High culinary students involved in preparing and serving the bimonthly lunches for community members and school staff. “We mostly use salad greens, herbs, flowers and a few vegetables in our Panther Cafe meals,” Chef Kim Plunkett, Vista High School culinary arts teacher, said. Planning for meals starts months ahead of time. Plunkett and agriculture teacher Sara Benner discuss menus. Benner follows up and purchases seeds that students plant and grow. Updates on when crops will be harvested are shared and menus are finalized. All culinary students are involved in preparing and serving the bimonthly lunches. Preparation work shared by students includes washing, chopping and preparing food. Students also polish silverware, level cafe tables and set out the host sign. Choreographed lunch operations involve 119 students from five class periods. The day of the lunch more than a dozen students sign on for positions of cooks, servers and hosts. The fourth period class, which meets right before lunch, is tasked with readying to-go orders. The $10 lunch is a big hit with local residents. In addition to bimonthly lunches served from October to May, an annual farm-to-table tasting event is held each February. Meats from student-raised livestock are part of the dining experience. Last school year 40 recipes were served, and cooking demonstrations were done on site. “We served rabbit, several different sausages, pork roast, pork chops, pork steaks, ham, pork, barbecue sliders,” Plunkett said. Stuffed mushrooms, quiche and beef heart stew were also served to diners. The lessons learned by students are many. Food used in the meals are jumping off points for instruction. “My culinary 2 students and I plan and design the menu to align with what culinary 1 and culinary 2 students are learning in class the week before the cafe,” Plunkett said. Rigorous coursework includes the topics of building a career in the industry, food safety hygiene and cleanliness and culinary math. “Our curriculum is written by the National Restaurant Association Foundation to prepare students for college and careers in the hospitality and foodservice industry,” Plunkett said. Many graduated students work in the industry locally in Vista, Carlsbad, San Marco and Escondido. Others have spread their wings and gained industry employment in Napa Valley, Virginia, North Carolina and Minnesota. Panther Cafe lunch dates are announced in a group email invitation. Reservations are taken until the 26 inside seats and 14 patio seats are full. Lunches are also delivered to school staff. Community members who would like to be added to the invitation list are asked to send a request to kimplunkett@vistausd.org.